Many Images have been made into Limited Edition Glice'e Prints on Canvas , Photo Prints (8x10) with Mat $39.00, or Poster Prints fit 11 x 14 opening of a mat for $20.00. Email me with your interests. Irene's Fine Art Studio was in Laguna Niguel, CA and is now located in Port Townsend, WA and hopefully, soon will be in Tempe, AZ. 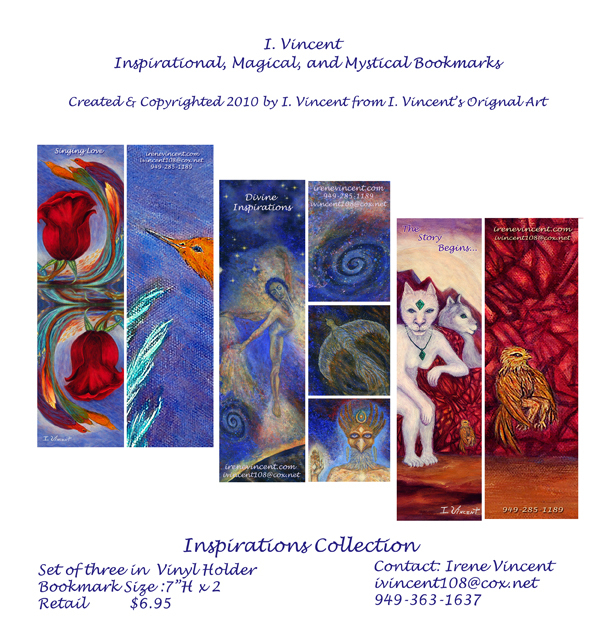 To Buy Art from Irene you can call at 949-285-1189 or e-mail at ivincent108@gmail.com. This is my valid phone and email as of 2018 plus. Once I know the art piece that you would like, I will email you with shipping and handling, get your approval, and then invoice you through Pay Pal. 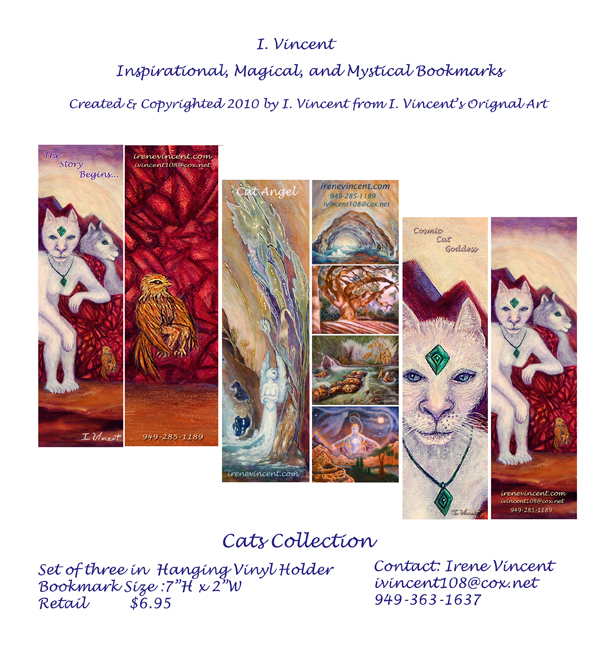 Individual Bookmarks are available at $2.50 each. Handling and shipping starts at $5.00. 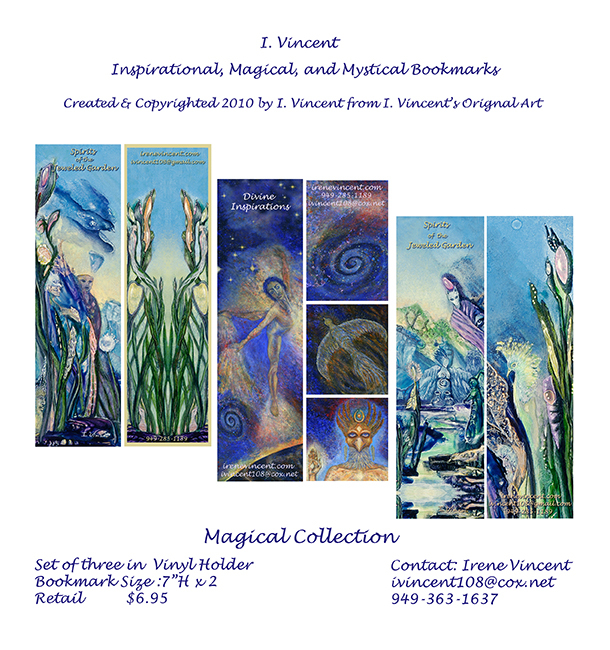 Available Wholesale and As images where info can be personalized for you and your business. Contact me at ivincent108@gmail.com or 949-285-1189. 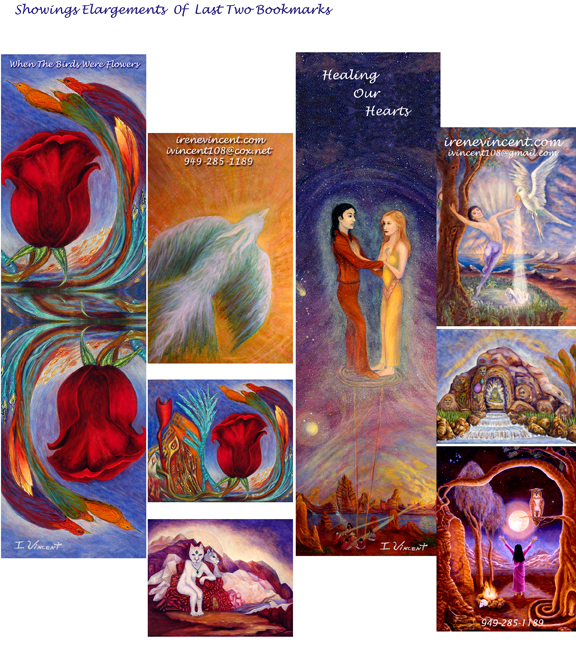 Cards, postcards, prints, and limited edition and non-limited Giclee Prints available. You can set an appointment to view artworks in person at my studio. The quality of the mural size paintings are much more exciting in person and the smaller paintings are more intimate. Also If you would like to be on my mailing list for studio shows or up coming classes please email me. We accept all MAJOR Credit Cards & Checks through PAYPAL. Shipping and Handling Costs are Extra. CA Tax may apply. If for any reason you do wish to exchange your print/s or art, it is our policy that the customer must pay the return postage and the print/s or art must be fully insured and be received undamaged.